Carl Singer testifying before Congress. On June 22, we celebrate the anniversary of the G.I. Bill, a historic act that was the first major piece of legislation dealing with the postwar era challenges to come. With veterans coming home to already fully staffed factories, the G.I. Bill, officially known as the Service Member Readjustment Act of 1944, helped stop another recession by providing education and housing opportunities to veterans – allowing them to create new jobs and businesses in America’s new booming economy. However, the Jewish effort behind the G.I. Bill is little known to the public. In 1944, there were large groups of World War II veterans already living in the United States– discharged for either disability or family reasons. 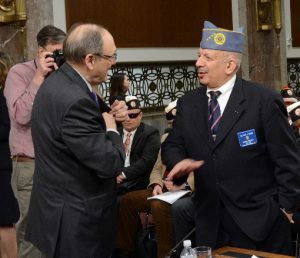 A column in The Jewish Veteran explained, “Vets are being discharged more than 8,000 a week. More than a million have been honorably discharged since Pearl Harbor.” Many of these veterans brought with them unique postwar challenges similar to those war-related disabilities we see in today’s veterans. 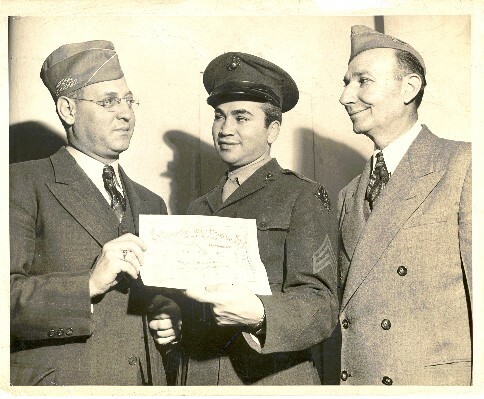 With over 50,000 Jewish World War II veterans discharged in 1944, the Jewish War Veterans of the United States (JWV) was one of the first veteran’s organizations to anticipate the needs of the returning soldiers. Their national headquarters already had staff working on job placement, vocational training and treatment for disabled veterans. It was no surprise when the American Legion announced their “GI Bill of Rights”, JWV was one of the first organizations to join on in support of the legislation. “JWV exists to our soldiers and veterans. Whether it’s visiting a single veteran at a nursing facility or going to Congress to speak on behalf of all veterans, we are there and we will be there. It is vital that we get our message out. Not for recognition, but for support from the many people and organizations that endorse our mission,” said Singer. If you would like to get more involved in the current G.I. Bill debate, please contact your local JWV chapter.